If anyone has a story about or message for Bill that they'd like to post, please share it under comments. All the very best wished Bill. Happy Birthday Bill. I hope you had a special time on your day and that this next year is filled with much success and fishing pleasure. 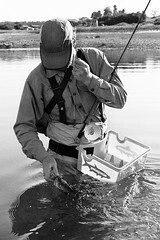 You've been a tireless advocate for the Patagonia Fly Fishing Brand, the sport and the environment. Thank you. All the very best. Buckeye! I hope the next 29 years are as fun as the last 29 have been! May the rivers you fish always run cold and clear and the flats you wade be be hard and sun-drenched! Thanks for your tireless work. Happy B'Day, Bill. No one should be allowed to have as much fun as you do, but then again, if I had to pick someone for the job, you'd be the one. We hope you bought some carbon offsets for all those candles. Happy Birthday and best wishes to the numero uno Patagucciac. Happy Birthday to the officially unofficial Mayor of Fish. Thank God you still act younger than you look! All my best! Once, awhile back, Mr. Bill and I shared a canoe in the hinterlands of the mainland south FL. He was so enamored with my ability to rapidly consume warm and nearly toxic Busch beers and at the same time, wax on eloquently about the flora/fauna of a unique and endangered eco system that he forgot to say "good bye" at the end of the day. In spite of this, I always look forward to seeing him. Happy 40-ish Bill. A happy birthday to you! As others have said, thanks for your continued dedication and hard work on behalf of all of us who love the sport of fly fishing and the environment. Hope we get to play a little together this year. Thanks for your continued support! Happy Birthday Bill. My b-day is April 2-we'll have to get together one of these years and go bonefishing and rum drinking for a joint celebration. may your year be a great one, and may we fish together in striper camp. Happy Birthday Bill from the land of Tubes and Tunnels! All the best and we look forward in having you come visit again. I decided not to drive my truck for a year to achieve carbon neutral offset. And my relationship with the fire department and National Forest is almost back to normal as I finally have them convinced that I was not trying to do an illegal burn, it was all that smoke when Sam and I were trying to blow out all those candles. I have that cat who ate the canary grin on my face because of my early upbringing in Cleveland where I thought I was a great angler. Every time I went to the beach, I had managed all these huge fish. Turns out I was told that burying all those dead fish from the polluted lake did not constitute being an angler, it was mortuarial skills. As as result, I did not go into the Funeral Home business. Although there are similarities in the fly fihsing business. Now my new plan takes my angling skills and fly fishing business knowledge to create Catch and Release Atlantic Salmon Lodges in Norway and UK. This will be headed up by Paul Bruun. Jeff Leopold and John Collins - with guaranteed catches of 25 fish per day - all over 20 kilos. That comes with a minimal consumption of 1 liter of Line Aquavit per day and 15,000 calories of food. Many thanks to you all for the birthday wishes. Paul Bruun and Craig Amacker both share this April 2nd natal Day, so Happy BDay to you all. happy birthday... you seem to have things figured out, always with a wonderful attitude and a sense of hope and adventure... I'll never forget going up that snowy hill in xcountry skiis with the tetons in the back .. thank you for your vision in conservation and hospitality and friendship!!! Think Central Wisconsin, lunch counter with Erin Atkins, and a video camera. Friday night racing anyone? Hey Bill, tell everyone about that GTO you wrecked in high school....ouch !! !